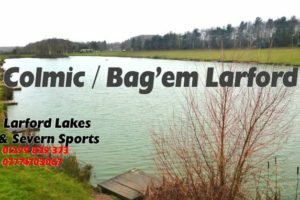 Conditions for round 2 of the Pairs League was favourable on the Match and Specimen lakes for the 20 anglers (10 pairs), with highs of 16C and a gentle breeze. The match lake kicked into life with lots of carp and F1’s making up very respectable weights. Overall winner was Steve Rocke (Larford) who drew peg 62 on the Match Lake. Steve had a slow start fishing the pole long and short with pellet. Later in the match, his edges came to life and Steve landed a carp and F1 catch that pushed the scales to 106-06-00. Second on the day was Scott Poynton (Rive) who drew peg 59 on the Match Lake. Scott fished pellet and corn short and down his edges to weigh in 97-06-00. Third in the frame was Max G (Larford) who drew peg 56 on the Match Lake. Max caught long and shallow with pellets and later short and down his edge to weigh in 78-14-00. Fourth overall was Ian Giddins (Frenzee / Bag’em) with 77-14-00 from peg 60 on the Match Lake. Fifth placed Simon Harris weighed in 71-08-00 from peg 46 on the Match Lake. Simon fished pellet and corn short. Sixth overall was Chris Senter from peg 6 on the Specimen Lake. Chris caught on the long pole with pellet and corn weighing in 64-05-00 of bream and carp.